Cottage includes master bedroom upstairs with queen bed, bedroom 2 on main level with bunk bed (twin top & double bottom), Kitchen includes cooktop stove, Full size fridge, toaster, hand mixer, Single serve coffee maker (k-cup compatible) air pop popcorn maker, dishes and cooking supplies, radio, and dining table to seat 4. Living area includes love seat, 2 arm chairs and tv/dvd combo. Bathroom includes stand up corner shower. Laundry room includes washer. Large lakeside patio includes table seating for 6 and new BBQ. Lake front has a sandy shoreline with viewing platform and stairs for beach access. Cottage has air-conditioning and heat pump. Close to the beautiful historic town of Annapolis Royal this quaint cottage offers a quiet and peaceful escape. It boasts amazing lake frontage and incredible views from the cottage. Grand Lake is a great lake for fishing, boating, kayaking or canoeing. Warm water temperatures and sandy shorelines make it ideal for swimming in the summer. The natural sand shoreline and soft, gradual decline lake bottom make swimming ideal from the shores edge. The lake is quiet with minimal motorized boats. The cottage name "Blueberry Shores" came from the natural wild blueberry bushes that line the sandy shore line. Property is large and wooded with slight views of neighbouring cottages. The cottage sits on a high point of the property giving it exceptional views of the lake. Beautiful property, super clean, gorgeous views, very private. I could go on and on. Very comfortable with all the amenities of home. Can't wait to go back again. This property is a must book! Wonderfully peaceful time on the lake. Blueberry Shores far exceeded our expectations. It matched the description in the listing, and was clean and well maintained. The listing, however, could not convey the overall beauty of the location. The views of the lake are soul nourishing. The waters are clear and warm (at least when we were there). The lake is big enough to explore nooks and crannies that are not yet developed. The cottage itself was very cute and quite comfortable and private. 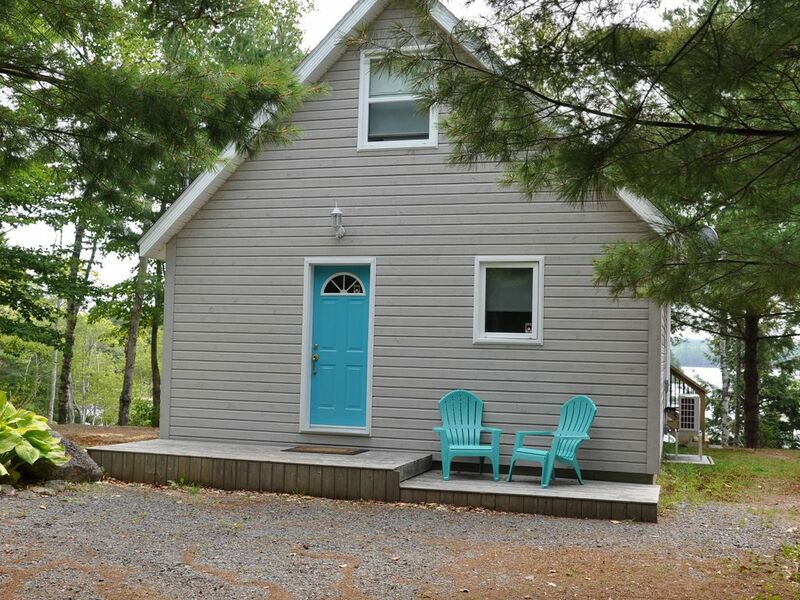 The main deck attached to the cottage is great and there is a mini-deck down by the lake is that is very sweet. Annapolis Royal is about a 25 minute drive, and has some cute little restaurants and historical stuff to see. Kejimkujik National Park is about a 1/2 hour drive. I highly recommend it for kayaking or canoeing. It is extremely beautiful. The owners provided excellent service. I would definitely recommend Blueberry Shores to anyone looking for a peaceful, fun retreat. We had a wonderful two weeks staying at Blueberry Shores. The cottage was clean and beautifully decorated. We had everything we needed. Our hosts left a beautiful welcome basket. Our children enjoyed boating, the beach and the outdoor space, and there was lots of opportunity to watch the wild life and relax in the sun . The Annapolis / Digby area is home to so many wonderful attractions and festivals, you cannot go wrong. Thank you for having us. We are planning next year's trip back. This was the perfect getaway for our family of the three. The cottage is very charming and well equipped with everything you need and more. The kitchen had everything needed to cook family meals with lots of space for dining indoors or out. The view from the deck is beautiful. The beach area is nice and sandy as well as the entry to the lake. I enjoyed the chairs down by the beach for drinking my morning coffee and enjoying a little shade on the sunny afternoons. We had a great time fishing from the beach there are lots of fish in the lake. Overall this was the perfect relaxing summer vacation, there are lots of things to do in the area but we could not bring ourselves to leave the cottage. Our little guy already wanted to book again for next year and we will be looking forward to going back again too.